Northern Bear were tasked with a new build, timber frame extension to Cleadon C of E Academy which would act as the Nursery for the students prior to enrolling in the main school. The original site was a large playground surrounded by 1200mm fencing and vegetation which required removing prior to a site strip and rerouting of existing services that ran through the middle of the proposed building. The existing levels of the site required a retaining wall to the front car park the full length of the extension and some remedial works to the main carpark following the completion of the retaining wall. 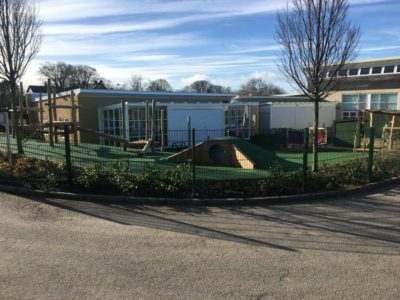 Existing ground levels were an issue throughout this project as the surrounding access roads and car parks created a valley-type surrounding which required the removal off a large quantity of material off site prior to the laying of playground subbase. The new timber frame building sat on a raft foundation due to the soft earth below and was connected to the existing masonry building. The exterior walls of the timber frame building were formed with a render system with a large twinfix canopy to the rear of the building that acted as an indoor play area for the children during those rainy playtimes. The main rooms of the extension consisted of a reception, meeting room, accessible WC, kitchen/staff room, cloak room, quiet room, toilet area and a large, open main nursery (shown in the photograph). The main nursery had exposed glu-lam timber beams that ran the width of the building with acoustic panels to reduce noise issues caused by the large open space and ceiling heights which were over 3.5m high in areas and aluminium windows and doors. The internal areas were fitted out with specialist furniture including IPS system, worktops, kitchen and curved seating to the specialist semi-circle tea bar area. 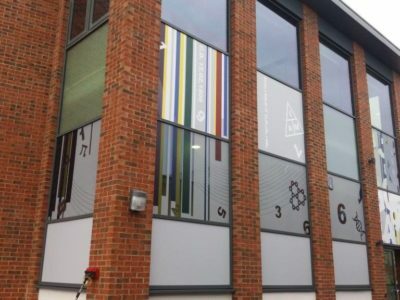 An UFH system was implemented and connected up to the existing system for the main school. Externally the playground was encapsulated with new fencing and a planting area was created to a steep banked area for future use by students. The playground was finished off with a soft pour mix, with areas of flagging for access to the rear and side of the building for maintenance. Specialist playground equipment was fitted throughout the playground which included an amphitheatre, water feature, play tunnel and climbing frame. We have completed the construction of 4 no. 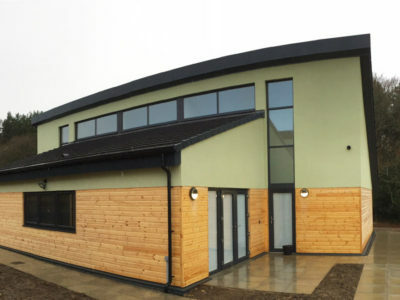 bespoke four bedroom respite lodges for children and adults with autism for the North East Autism Society at New Warlands Farm, Holmside, County Durham. The lodges are situated in a rural setting adjacent to two existing lodges and local to the clients existing training facility, so that anyone using the new lodges for short breaks can also utilise the facilities within the training facility. The project included timber frame buildings installed on raft foundations and included timber cladding and render externally together with high performance insulation, windows and doors. Internally the lodges are fitted out with modern fittings and fixtures with kitchen, master bathroom and ensuite facilities with the autistic residents in mind so that they can have home from home breaks in safe surroundings. The lodges are set within 77 acres of secluded farmland and countryside within County Durham. Extensive drainage and external works were constructed to provide access to the four lodges and new playing areas and park areas were formed as part of the works. Following on from the successful completion of previous Phases we have successfully delivered the Student Central building at Northumbria University. The works were in the City Centre location with restricted access where we had to build our way back to the entrance of the site as the fabric of the building and the extensive external works on the project were land locked on three sides. There was structural steelwork and specialist glazing works which had to be delivered to a very tight site entrance utilising rigid vehicles as the use of articulated delivery vehicles was not possible with the erection of steelwork and the installation of the glazing of the structure being progressed from the furthest point on the building and working back towards the site entrance. There were a number of existing features (artwork) that had to be protected throughout the works. 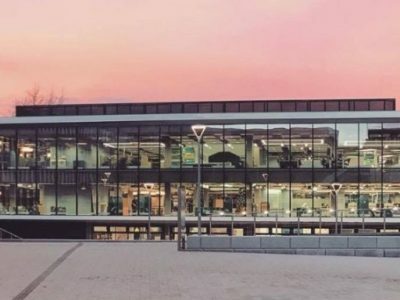 The works included substantial demolition works to an existing two storey admin / library building and the remodelling over the two levels to create a more open, airy facility to improve the student’s experience whilst on the campus. The gross floor area of the building was increased and a new lightwell was formed to allow light to cascade down through the centre of the building on both the ground and first floors. A new steel canopy was formed and new curtain walling was provided to all elevations. The new curtain walling had to be designed to a G factor of 0.4 and 0.48 to reduce the solar gain within the new building footprint. The internal fit out was ready for the students to use when they returned to the campus on 11th September 2017. The external works were progressed in tandem with the internal fit out and were handed over to the client in a phased manner to ensure safe access was available into and out of the new facility at the end of Sept 17 with overall completion of the external works achieved by mid November 2017. Works involved the isolation of all existing mechanical and electrical services. A full strip out of all cubicles, sanitaryware, vinyl flooring, ceramic tiling and demolish internal walls to create new toilet layouts. New ‘Mistral HPL Range’ toilet cubicles, IPS Panels and vanity units were installed complete with infra-red sensored motioned sanitaryware. Flooring and walls finishes were replaced with ‘Vitra Gloss White’ ceramic tiling and final decoration. 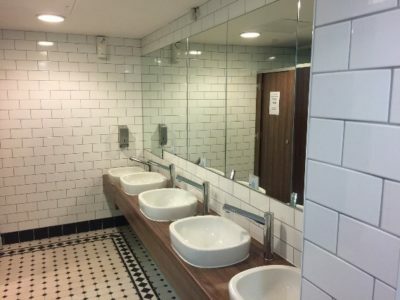 State of the art appliances and full width mirrors spanning the length of the vanity units were installed to complete the refurbishment of the six toilets. All the works were completed while the cinema continued to operate. The client has confirmed that the ongoing works had no affect on takings. 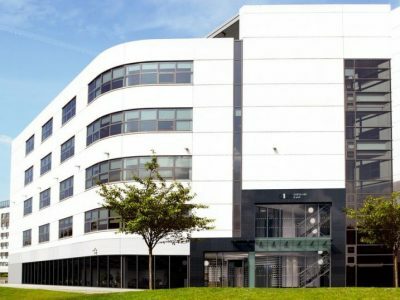 As part of Northumbria University’s strategy to improve the student experience Northern Bear Building Services Limited were appointed to carry out Phases 1A and 3 on the student central project. Phase 1A was negotiated following the successful completion of four other projects for the University during the summer of 2015, and Phase 3 was secured as an open tender. Both phases were delivered in tandem as access was required through one phase to gain access to the other phase and as such, this proposal reduced disruption to the client’s occupied areas. Works were commenced with two weeks of the client’s instruction to proceed. 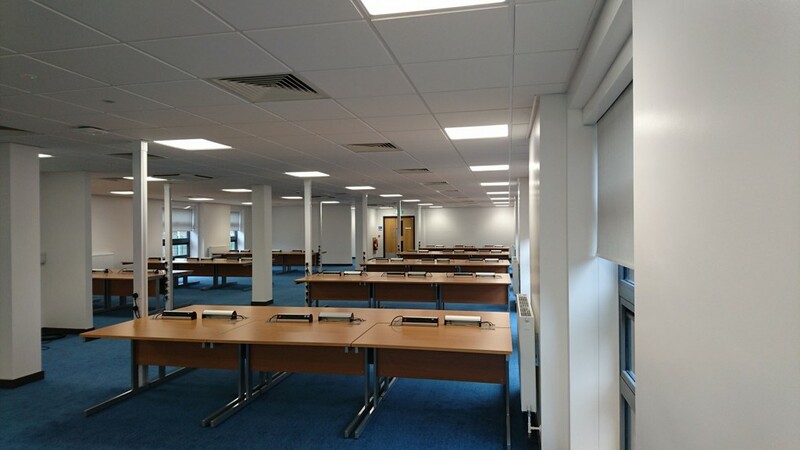 The works involved the full strip out of the work area back to the original structure, new mechanical and electrical services, fire protection, ceiling baffles and decoration, and the full fit out of the areas to create the new facilities. New raised floors were installed to create level access from one part of the building to a new level at the other side of the works area. 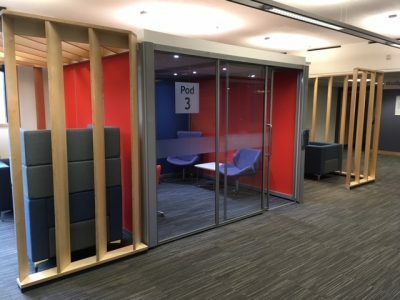 New stainless steel handrails and glass balustrade / screens were introduced and new manufactured joinery ‘pods’ were installed to create one to one spaces for the use of students / advisors. Both projects were of a fast track nature with the completion date of 15th January 2017 being critical to the client’s objectives, as a number of other University activities were scheduled around this date. The design of this area developed as the works were opened up and the site team and designers had to work in a collaborative manner to ensure that the design could be developed and delivered, to the client’s critical completion date of 16th January 2017. Access to Phase 3 was achieved through the Phase 1A works area to avoid conflict between building works and the universities day to day activities. Relevant information was issued to the supply chain as soon as it was available so that materials / manufactured items could be procured, whilst still ensuring that the key completion date was achieved. Phase 3 was executed in a similar manner and the completion date of Sunday 30th January 2017 was also achieved. 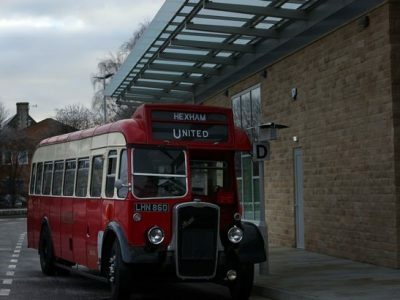 Northern Bear Building Services Ltd were contracted to construct the new bus station on the outskirts of Hexham to replace the existing bus station which was in the town centre. The new station was constructed on a raft with a steel portal frame to support the new ashlar and roughcast stone finishes and the Bouder roof and sedum green roof finishes. The new facility is light and spacious with the use of a glass flying roof structure and patent glazing on both elevations. The project has been designed to reflect the finishes present on the existing bus station and to reflect the type of materials local to the area. The ashlar and roughcast stonework were procured from the local Border stone quarry. Copper cladding has been utilised at both ends of the new accommodation areas. 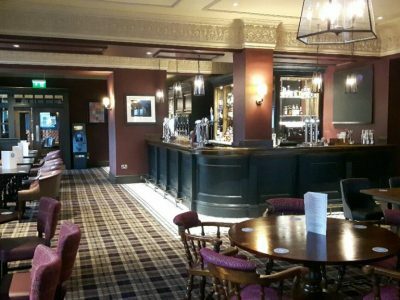 We secured the project through open tender but was in excess of the budget available and as such a saving of over £300k had to be realised before the project could proceed. Northern Bear Building Services worked with the client’s design team to review specifications / details to realise the saving so that the project could proceed. Northern Bear worked in collaboration with Northumberland County Council who were on site at the same time delivering other aspects of the scheme and shared welfare facilities were utilised to produce a cost saving for the client. close cooperation was required throughout the delivery of the project as it was necessary for Northern Bear to strip and remove access scaffolding around the building at key stages of the project so that NCC could progress their works. 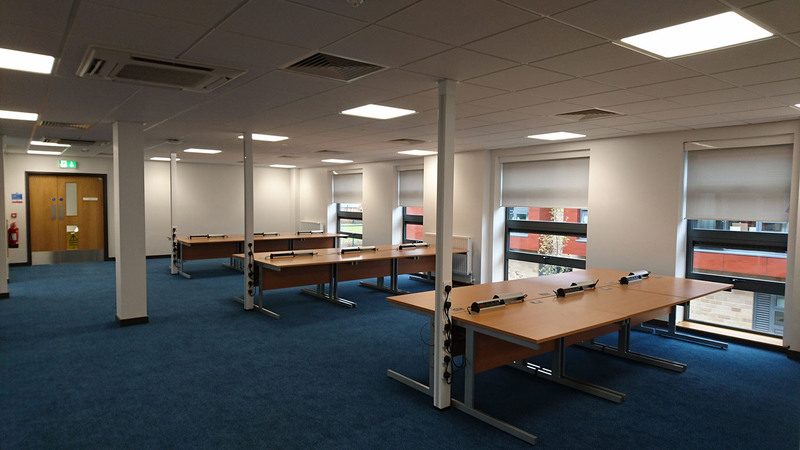 We were contracted to carry out refurbishment and alteration works within the CQC offices in Newcastle and Leeds. The works consisted of the design and installation of new data and power arrangements to align with the new office layouts. The works had to be carried out in a phased manner to ensure that the offices were live at all stages of the works and any noisy or service interrupting works were carried out, outside working hours, either on a night or at the weekend when the office was closed. The works had to be programmed around the client’s direct contractors who were responsible for the removal and disposal of the existing office furniture and the provision and installation of the new office furniture once the remodelling of the existing services and installation of new floor finishes was complete within each phase of the works. Temporary screens were erected to screen the refurbishment works on each phase from the remainder of the floor area which was still in use. We were not allowed to make any noise whilst the works were being carried out as the remainder of the floor continued to be occupied and as such any noisy works were carried out “outside of the office environment in the basement or “out of hours”. 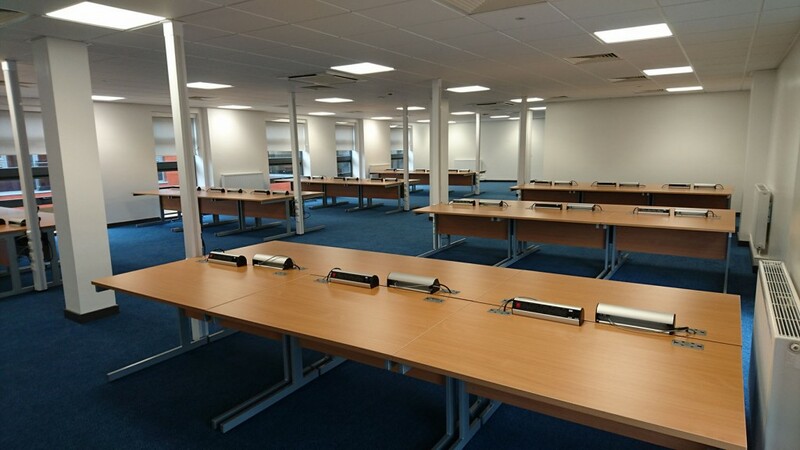 We also lifted the existing floor finishes and laid new floor finishes, decorated and also refurbished the staff kitchen area including the installation of a ZIP tap but again ensuring the facility was always live during working hours. The project finished ahead of schedule and without any disruption to the services on site due to excellent daily communication between our site manager and the office management team. 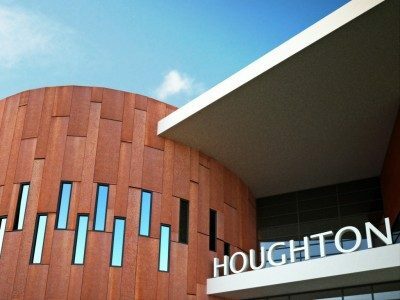 The new Houghton Primary Care Centre is a combination of health and social care facilities with sports and leisure incorporated. The care centre is an example how different NHS services can amalgamate into one, to provide a modern health care service for the residents of Houghton-le-Spring. We have successfully completed further fit out works to the Primary Care Centre, to allow the NHS to expand their services from the site. 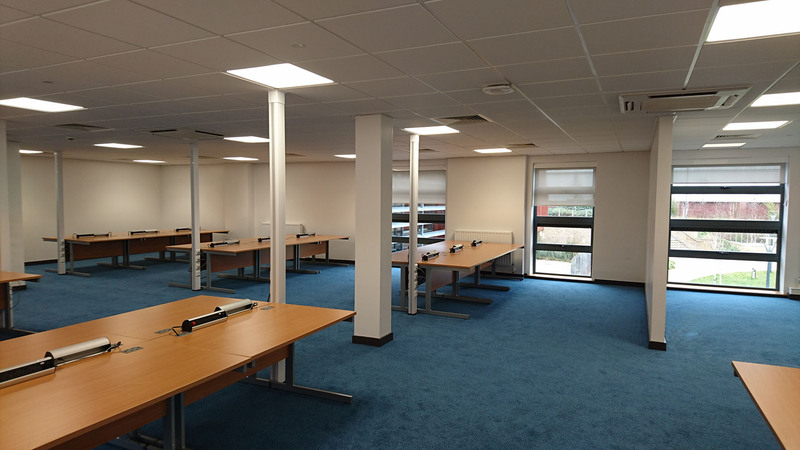 The works comprised of taking an unfinished ward and creating a new open plan office for the NHS administration staff. 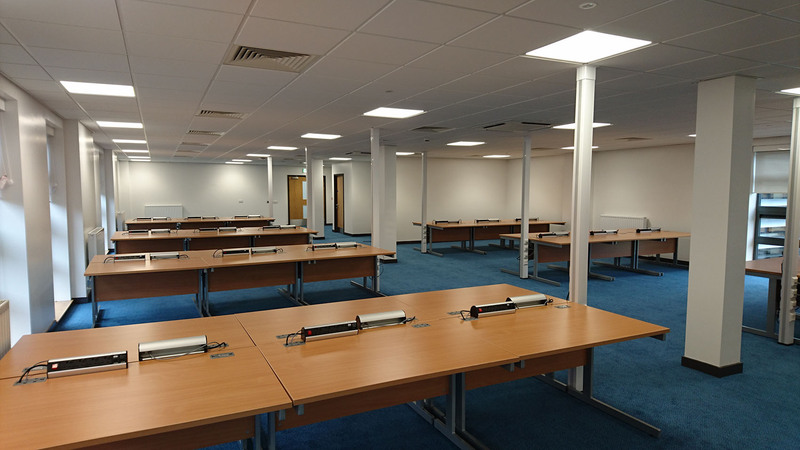 The works included new mechanical and electrical installations to help improve the already high standard building to make the area comfortable for all areas. With new heating and air conditioning works to allow the space to be cool through the summer and warm through the winter. New sun lights are being installed to allow natural light to flood the area to help reduce the use of artificial lighting.